Use this Google Sheets based calendar to stay on track with performance management plans and goals for this year! 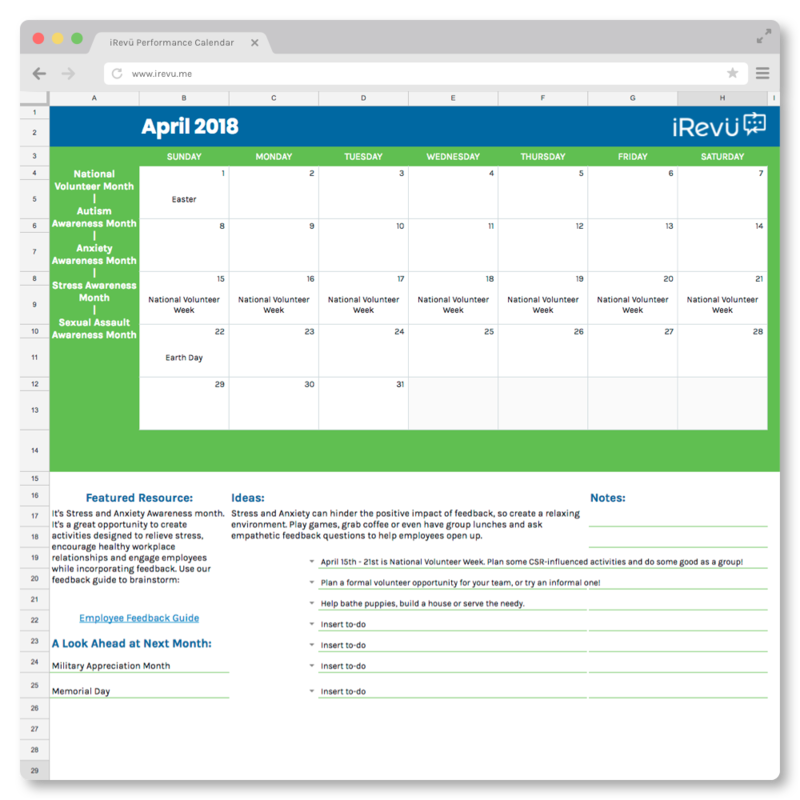 Edit tasks, use iRevü’s monthly resources and plan your performance management schedule around important holidays and monthly observances. Get the calendar now! Managing your monthly performance management tasks just got easier! Use the fully editable to-do lists to input your own tasks and stay on top of your goal plan. Edit on-the-go from anywhere! The calendar is created in Google Sheets so you can change on your desktop or mobile device at any time. Also, any and all edits are saved the moment you make them. Talk about continuous! The calendar includes important monthly and holiday observances! We also included resources to help guide your monthly performance management focus. Manage Your Performance Goals with the Performance Management Calendar! Monthly checklists, performance management ideas and featured resources – this calendar has everything you need to make your 2018-2019 goals succeed!